I just finished and launched a new online store - you can find it at LawrenceYangArt.com. In the meantime if you'd like to see my latest work, please find me on Facebook, Twitter, or Instagram. And as always, you can email me with any questions! For pricing on original pieces, please email me. Updated the artwork section with 15 new pieces and pricing! Hi all, just wanted to let you all know I'll be taking a brief hiatus from posting. No worries, I'm still painting! Right now I'm between shows, and just want to take advantage of this time to experiment and refocus on painting. Prints and pieces will still be for sale though, so please get in touch with any purchase inquiries. I'll be back and posting again in a month or so. See you all in March! Updated the artwork section with 25 new pieces and pricing! Massive update in the artwork section! 22 pieces, plus pricing for my entire catalog. Email me if interested in any pieces! It's been a long time since the last update... I have a big show coming up this Friday in San Francisco though! See the details here. Also, the artwork section has been updated with a bunch of new pieces, most of which will be in the new show! It's been a hectic couple of months! The Game Over at Giant Robot was a huge success, and I have my first show in New york next week. See a preview and more show info here! 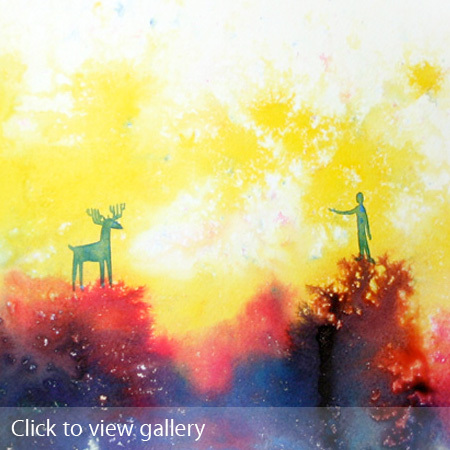 Also, the artwork section has been updated with around fifteen new pieces. Happy belated new year everyone! After a nice relaxing winter, the shows are starting to get booked. Check out what's coming up in the about section! New limited edition prints for sale! "Bloom", "Raspberry Triptych" and "Blue Meeting" are now available - see more details here. Also, Gelaskins added another one of my pieces and I have three shows coming up in the next two weeks! See all those details here. Last, updated the artwork section with eight new pieces! I'm almost out of prints of "The Chase"! So I made an online poll to enlist your help in deciding what the next print should be. I promise it's short, sweet, and full of pictures! Take the online poll here. Also, I've added some pieces to the artwork section. Neat! The "Creep Show" exhibition at Lower Hater Gallery is coming up in a couple of days! I've received a few emails from people interested in purchasing pieces from the show but don't live in the area, so I've created an online catalog of sorts. If interested, you can check out which pieces I'm showing, their prices, and the gallery's contact information for purchase inquiries. Lawrence Yang Creep Show Catalog. Looks like I only ever touch this page when I have shows coming up. Ah well... there's always my here. It should be a fun show -- a bunch of artists were each given a movie poster and set loose. From what I've seen so far, everyone's really digging into it and there is some amazing work. Also, I've added fifteen of my latest paintings to the artwork section. Take a look! I'll probably be using a bunch of these in the three shows coming up in October -- more on that in a bit =). Finally, an update! 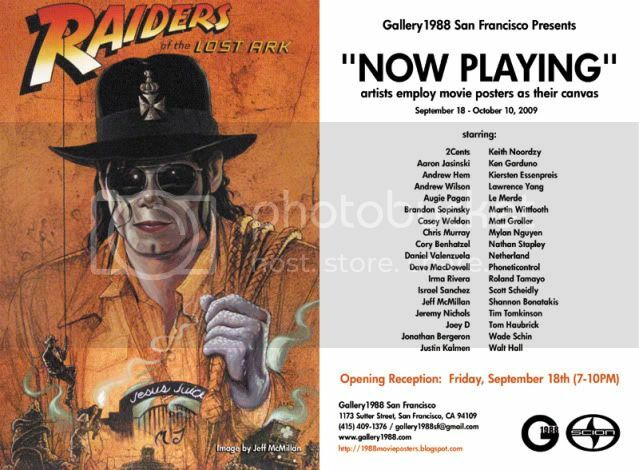 First off, there's a new show coming up on Friday, July 24th at Gallery 1988 SF -- view the flyer for the show here. In addition, I've added a ton of my latest paintings to the artwork section. The artwork section has also been updated to reflect what pieces are available vs sold as of today. Hooray! Hi all! 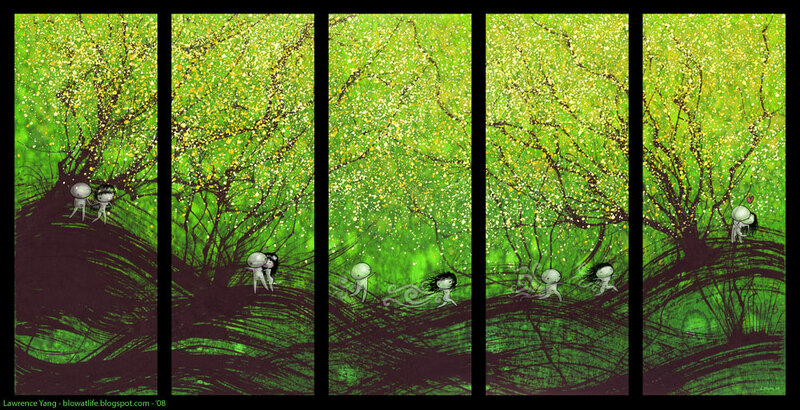 Continuing on with another show at Giant Robot - opening on May 16th, 2009. Full details here. There was a small mixup with the flyer so I'm not on it, but no worries, my work will be there =). Preview of my pieces here. Totally dropped the ball on this update to the site. So there's a show up right now at Giant Robot -- Tree Show V. It opened last weekend on the 18th, but will still be up for a few more weeks. Check out more details here. Also, updated my site with nine new pieces, mostly from the last two shows I've had at Giant Robot. Take a look in the artwork section. 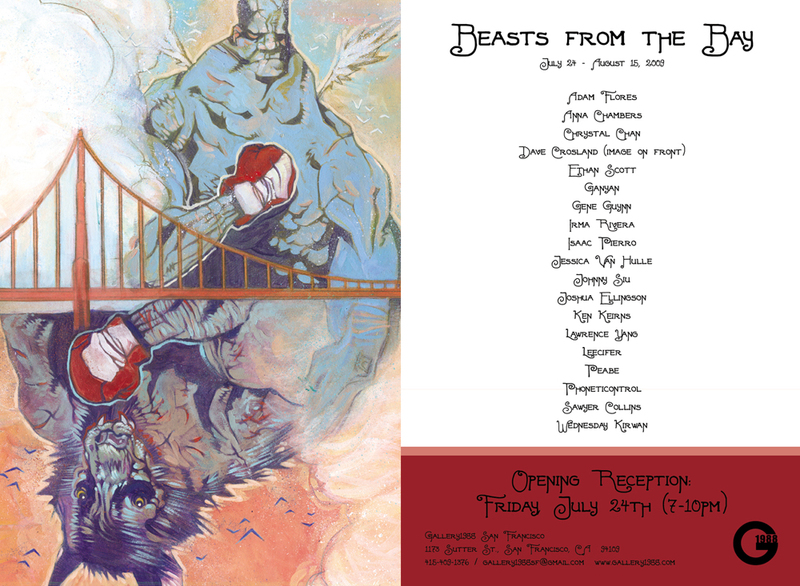 Ack, sorry for the late notice, but I'm showing work in a group show at Giant Robot SF on Friday, March 27th! Super excited about this, you can check details out here. Updated the artwork section with six new pieces. I'm in the process of cataloging my work, so once that's done I'll send out an update email. There are four shows coming up this year that I'm very excited about -- more details soon! Happy New Year! I've updated the artwork section with new pieces. Some other big news coming up, so stay tuned... =). or visit this blog post to see the pieces I'll be showing. Happy December everyone! I've finished framing and prepping for the show, and will soon be taking off to hang the work in the gallery space. Very exciting stuff... If you'd like to see details for my show, check out this blog post! I'm really excited about this show, it should be fun! To take a peek at the flyer and see the show statment, click here. My new book "Gathering" is now on sale! Follow the link below to see more details =). Hello -- APE was fun! I met a ton of really great people, got a lot of email addresses for my mailing list, and sold some art. Good times! If you want to get the full rundown, you can check out the blog post here. I've also added a few pieces to the artwork section, and am currently working on updating the store section. Stay tuned! Ahh! This update is ridiculously late, but I'm exhibiting today and tomorrow at APE (Alternative Press Expo) -- I have a booth where I'm selling buttons, books, cards, and prints. Come on by if you're in the SF area -- details here. Hi all! I've been very busy getting ready for the next few events coming up. Here's a quick update. This coming Friday, October 10th is the grand opening of 1:AM Gallery in San Francisco! I'll be showing five pieces, and it should be a ton of fun. Check out which pieces I'll be showing here, and see details for the show here. I've prepared some limited edition prints of "The Chase" . These are prints of the highest quality on archival watercolor paper. Each 12" x 6" hand signed and numbered print is available for $50. There will be 100 made! No more, no less. Email me if interested =). In addition to the prints, I will be selling a new book and a whole slew of 1" buttons. Details coming soon! I've been getting ready for a show in San Francisco that opens on October 10th. It is the first opening of this new gallery (called 1:AM), and I'm really excited to be in the company of some really great artists. Check out show details here. I've also been getting ready for the Alternative Press Expo coming up in a couple months. I'm working on a new book, buttons and prints. These are some of the buttons I have so far. There have been a lot of questions about my piece, "The Chase" -- and so I'll be doing limited edition prints of this piece for the expo. Last, my art is up on display at Kearny Street Workshop's annual APAture festival. There are some really great events going on from September 18th through the 27th, so if you're in the Bay area you should definitely check it out! Find out more details here. The 415 Show in Long Beach was fun! They are on display until October 9th, and you can find details at the DDR Projects website. I've added five new pieces to the artwork section and updated everything to reflect what has been sold. If you are interested in purchasing a piece, please email me. Thanks! As always, you can see what I'm up to on a daily basis at my art blog. I have another group show coming up in San Francisco's Lower Haight area. Check out Lower Haters for the show details, and my blog for a peek at what I'll be showing! The "Mountain Creatures" opening reception was a huge success! I never could have imagined the show going as well as it did. Tons of friends, coworkers, friends of friends, and random people showed up to check out the art. I ended up selling a bit over half of the work on the opening night. The work will be up for another month and a half, and I will be updating the art section to reflect what pieces are still for sale. Please email me if you are interested in purchasing a piece. Thanks! I've updated the artwork section to show which pieces I'll actually be showing at MR in a couple weeks. There've also been a few sales, so that's been updated as well =). As you can see above I have big news! My first solo show ever will have its opening reception on May 16th at MR-- a pretty sweet fusion of contemporary barbershop and a bar. I'm really looking forward to the show, and have been preparing like a madman. There will be about thirty five pieces on dispplay, and space will pretty much be filled with my work. Most of the pieces will be on sale, so hopefully that side of things will go well too! You can take a look at some of the pieces I will be showing in the artwork section, and take a look at the space I will be showing at here. Big news! 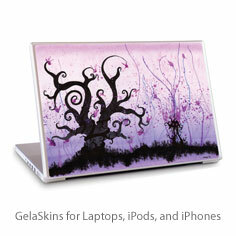 I've just signed a contract with GelaSkins, and they are now carrying my piece "Growth" in their line of GelaSkins. Click the tile below for more details =). Also, I've added three pieces that I did for the Robots and Monsters charity project to the paintings section. Happy belated new year everyone! And happy Chinese new year next week! I've just updated the artwork section with a bunch of new pieces that I've been working on. Otherwise... there are a bunch of things in the pipeline, but nothing I can announce yet =). Stay tuned!